Saint Syncletike was from Alexandria in Egypt. She lived eighty-three years in virginity and asceticism, and became the leader and teacher of many nuns. What Saint Anthony the Great was to men, she became to women: a model of mortification of the flesh, of patience in afflictions, and of wise instruction; for this, she is known a "Amma," a title corresponding to "Abba." Towards the end of her long life, she was stricken with an exceedingly painful disease, which she endured with faith and magnanimity. She reposed in the middle of the fourth century. It is said of Saint Syncletike that she was the virgin who hid Saint Athanasius from the Arians for more than a year in the environs of Alexandria, and it is to Saint Athanasius that her life is ascribed (PG 18:1488-1557). O divine Syncletike, our righteous God-bearing Mother, thou didst shine forth as a lamp bright with unquenchable virtues, laying bare the dark devices of the deceiver; and thy light guided a multitude of wise virgins to the heav'nly bridal chambers; together with them, pray that we all may be saved. 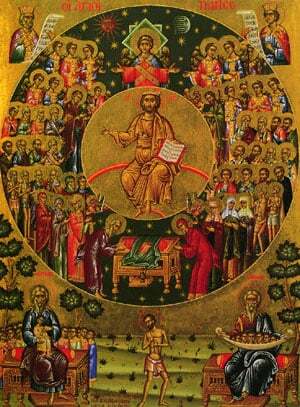 Share the feast of Righteous Syncletike of Alexandria with an icon greeting ecard.